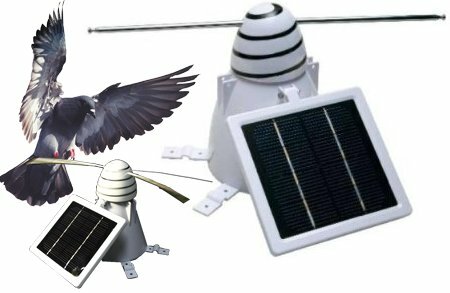 Currently viewing the category: "Unusual Tools"
Bird-B-Gone’s solar powered bird repeller has to be one of the strangest products I’ve seen, and I’ve seen my share. It’s reminiscent of a stereotypical nerd’s beanie. The repeller uses a continuously rotating “propeller” to sweep birds away from just about any flat or angled surface and keep them from shitting all over the place. Two adjustable arms mounted to a rotor cone extend to cover up to a five-foot diameter area. The solar panels charge 3 AAA batteries so the brushless motor will rotate at a continuous 30 RPM during the day, night, or cloudy weather. If you’re looking for a camp shovel, rather than buying the folding variety, check out this Special Forces Shovel from Cold Steel. Sure, you can use it to dig, but you can also use it as a hatchet, an axe, a cleaver, a machete, a hammer, a paddle, and if you get bored you can throw it! J.W. Done makes an interesting tool for deburring internal cross holes: the Orbitool. As you may know, when two holes are drilled into one another there’s usually a nasty burr that can be very hard to remove. The common solution is steel or abrasive brushes; however, those can negatively affect bore finish and diameter. The tool is a half round bur with the largest diameter at the end of the tool and a polished collar around the periphery. In use it’s inserted into the hole and pressed against the wall of the hole. When it reaches the cross hole the machine revolves the tool (or the part is revolved around the tool) filing away the burr at the intersection of the holes. They show both manual and automatic usage in their YouTube videos. They also offer carbide and abrasive-headed tools that operate on the same principle. There’s a detailed test report (.pdf) that shows the results obtained in a range tests. 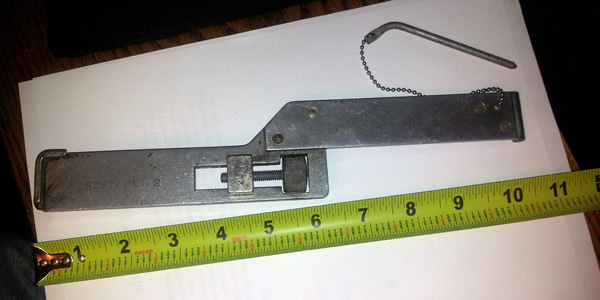 Has anyone out there had the opportunity to use this tool? Looks like a great way to deal with a common problem in all sorts of manufacturing and hobby metalwork. 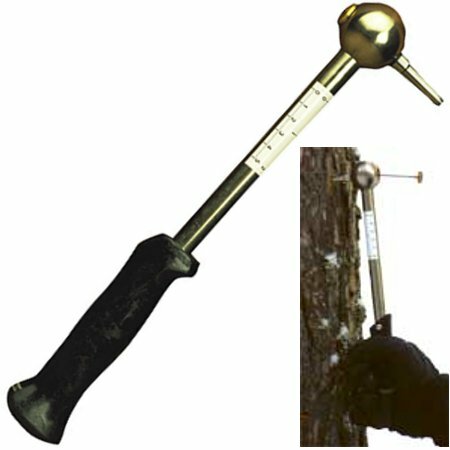 If you need to take some quick tree core samples to determine the rate of growth last year, one tool you could use is this Swedish-made increment hammer from Haglof. To take a sample, all you do is strike the tree perpendicular to the trunk and and pull the hammer out. You then eject the core with the steel plunger. Made from high-quality hardened Swedish steel, the 11-1/2″ hammer takes a 0.157″ (4mm) diameter by 3/4″ long sample from either hard or soft wood trees. A 2″ graduated scale on the shaft of the hammer is graduated in increments in 1/20″ or in millimeters for taking a quick reading in the field. With an investment of $80 you can start taking some core samples. The ejector and the hollowed tip are replaceable if you damage them and cost $18 and $20 respectively. 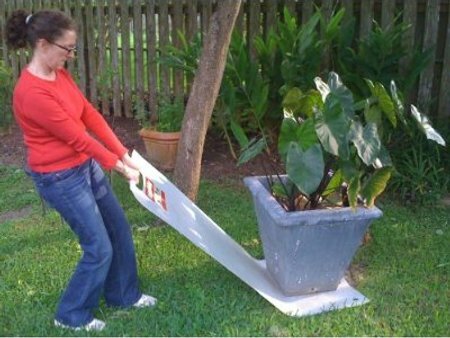 We’re hard-pressed to see why anybody would pay $75 for the Professional Bigslider Utility Mover. It seems to be a beefed-up version of those roll-up slides that you hated when you were a kid. In the interest of fairness we’ll give you the spiel before we ask your opinion. You place the Bigslider underneath heavy objects up to 500lbs to slide them around on just about any surface including grass, concrete, carpet, and tile. The 2′ x 5′ x 1/16″ thick flexible plastic sheet weighs 3 pounds. You can also roll the Bigslider into a cylinder and insert it into your trash bags to keep ’em open while filling them. Brush off and clean the Bigslider with water and mild soap as needed. Obviously the Bigslider is easy to store — you can hang it, put it on a shelf, or place it behind the bench like you’d store that giant piece of cardboard you put under the car when changing the oil — but just don’t store it in direct sunlight. So would you pay $75 for this product if you needed to slide around some heavy objects, or would you pass? Is the Bigslider Hot or Not? Let us know in the comments. I hate running around and trying to find tools when I’m working on a project, so whenever possible I like a tool that can combine the functionality of two tools into one — like the Sod Buster here. 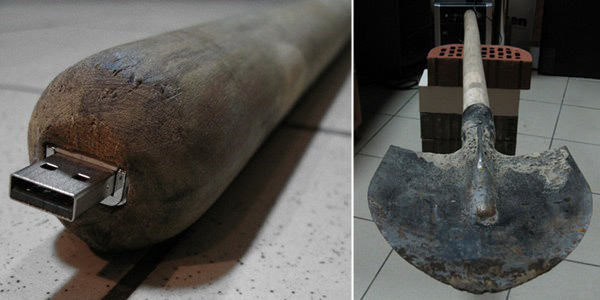 It combines a small sledge and a cutting edge. It could help out if you’re doing concrete forms around roots, for instance, where you could be pounding stakes and cutting roots all at the same time. I’m not quite sure who makes it, but I found this one with a heavy-duty fiberglass handle online for $20.